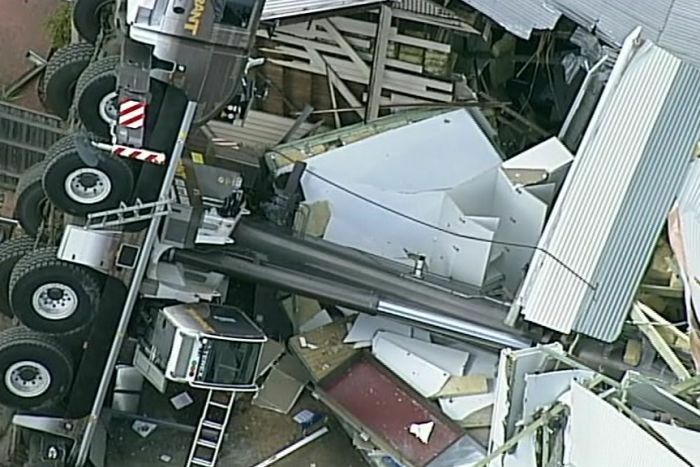 A woman has narrowly escaped serious injury after a crane carrying a pre-made home toppled and crashed through the roof of her house in Melbourne’s west. Fred Pace and his cousin Daniel Pantalleresco were also inside the house when the crane fell about 1:00pm. “Me and my cousin Daniel were sitting down watching TV and all of a sudden the roof just collapsed and the side of the house came in, and we were so confused [by] what happened, we were screaming, just ran for the exit,” Mr Pace said. “My mum and dog were just under it, so if we didn’t scream and say ‘move’ they probably would have just got crushed and it could have been a lot worse than what it was. 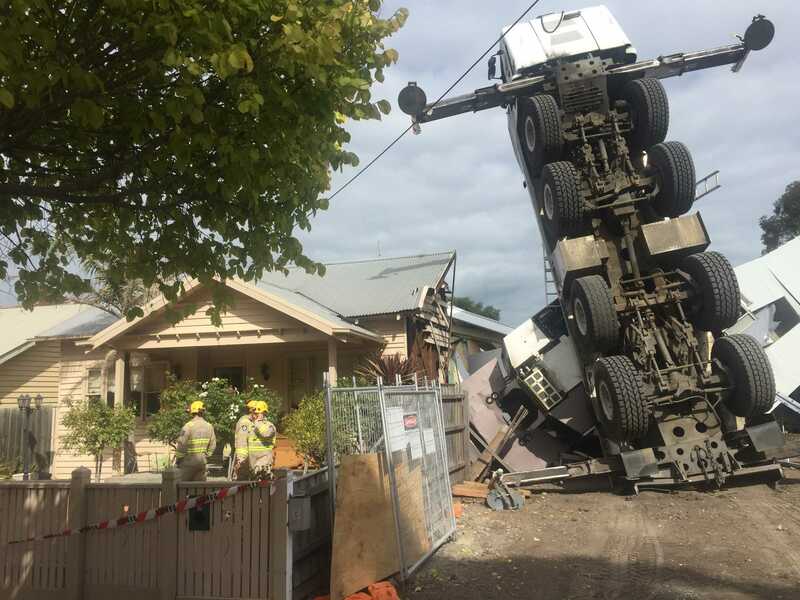 He said the mobile crane had been lowering a pre-fabricated home onto a block in Yarraville when it collapsed. Mr Pantalleresco said if the crane had fallen just a metre or so to the side it would have crushed his aunty. “We just saw the crane coming into the house. That’s when we knew we had to run,” Mr Pantalleresco said. About 20 firefighters were called to the scene on Schild Street, the Metropolitan Fire Brigade (MFB) said. 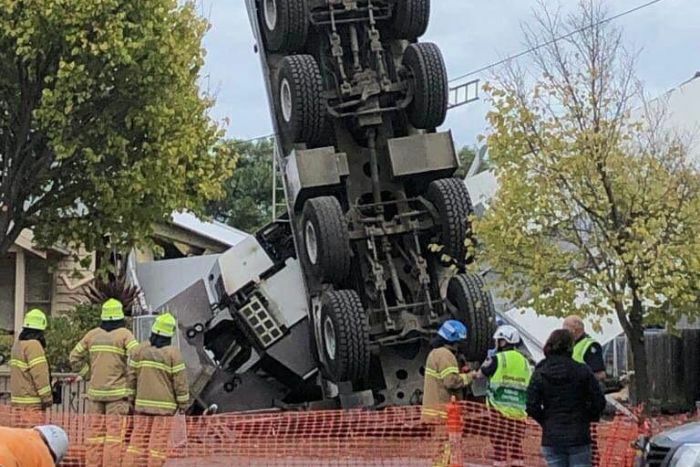 The crane operator and a rigger who were working at the scene were assessed by paramedics but were not injured, the MFB’s Roger Chitty said. He said the crane collapsed while it was “repositioning” the second of three modules that would have made up a pre-fabricated home. He said WorkSafe engineers would oversee preparations to remove the crane. “There’s two rather large cranes coming, one to hold and one to lower, to make sure there’s no further damage to the structures,” Commander Chitty said. The crane will remain in place tonight, with the recovery operation expected to take place early Thursday morning. Commander Chitty said the local council had offered emergency accommodation to the family whose home was extensively damaged by the crane. The crane bears the logo of Melbourne-based crane hire company Tarrant Logistics, which has been contacted for comment. WorkSafe will investigate the cause of the crane collapse.